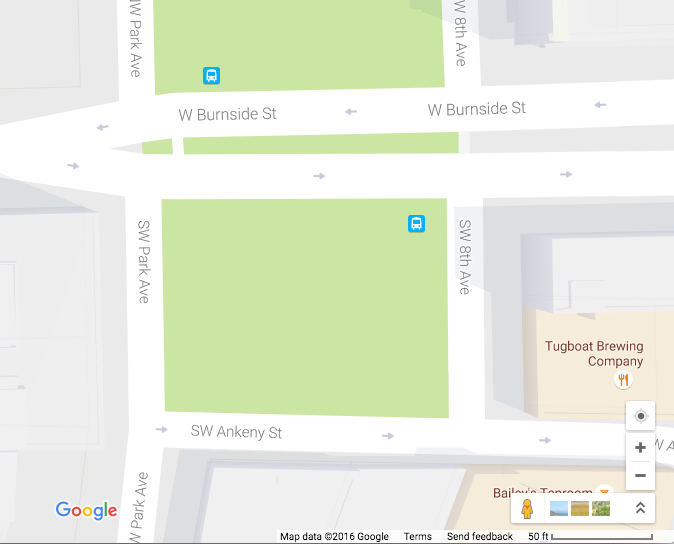 The low, steady rumble of electric guitar and the sharp thump of drums could be heard down Burnside Street and throughout the North Park Blocks on Aug. 20. 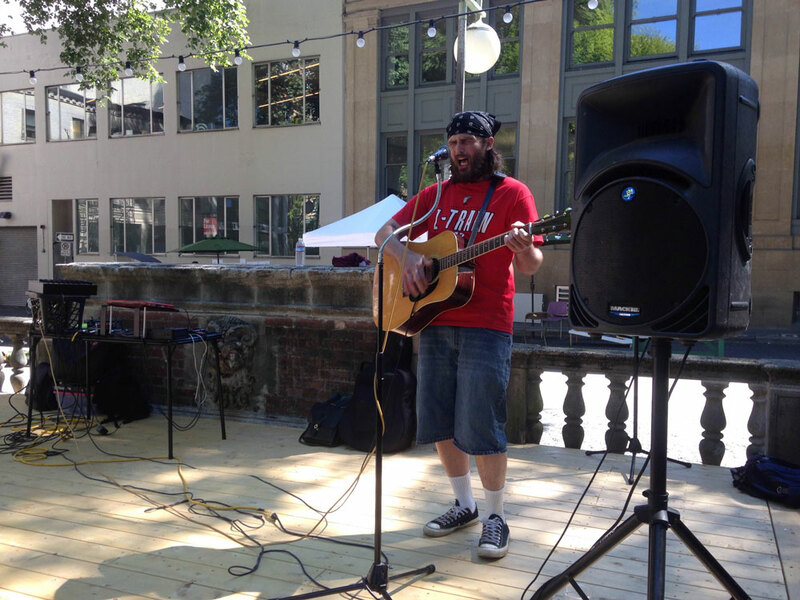 On that exceptionally hot and arid Saturday afternoon, the sounds reverberating through this troubled area of downtown Portland marked the first performance in Ankeny Square since revitalization efforts began. Half a dozen people sat on picnic benches in the park; another six stood nearby, looking toward the pale, wooden, rectangular stage that now lines the southern end of the square. Some people stopped to order food at one of the three food carts located within the park. Jamal Gardner stood next to one of Ankeny Square’s distinctive, derelict public restrooms. He is tall and slim and wore a sleaveless t-shirt and baggy shorts. He is of Jamaican and Cuban descent, and his face is framed by pen-width dreadlocks that fall past his shoulders. His beard and hair are beginning to gray. He often smiles as he talks to friends or passersby, a wide, toothy expression that is infectious. Gardner, 38, has been smiling a lot lately. He is now in charge of Ankeny Square – the small park between Burnside Street and Southwest Ankeny Street that, for decades, has had a seedy reputation and attracted drug use, loitering and vandalism, as it fell into neglect and disrepair. In an effort to revitalize the space, Portland’s Parks and Recreation bureau announced this past spring that people interested in creating community projects at the park could submit proposals to the bureau. Gardner’s proposal was selected from a pool of 15 in May. Ankeny Square will become host to five multicultural food carts and a small stage that will be a performance space for any artist – writers, musicians, jugglers or others – to perform and share their art and talent with the public. “Anybody with any weird talent – that is family friendly, of course,” Gardner said. He calls his vision for Ankeny Square, and the name of his business, Grubbin’. It’s also Gardner’s mission in life. After years spent on the street and in prison, he now hopes to build and foster community through food, music and interconnection. The performance that afternoon was part of the Oregon Walkways event, hosted by Better Block PDX, an advocacy group for public spaces. Josh Kletzkin, a guitarist who kicked off the afternoon’s music session, and drummer Kris Sarles, form the band Irving. They call their music “paz” – a combination of pop and jazz. “It’s an honor to play outside in a space that (Gardner) restored and made so much more accessible to people,” Kletzkin said. Ankeny Square has undergone a facelift in the three months since Gardner gained control of it. The short, emerald green grass is gone, replaced with gravel. Several picnic benches sit throughout the park. At the southern end, between the two brick public restrooms that became notorious for drug activity, there is a rectangular, wooden stage large enough for a four-person band. Four strings of lights hang overhead. Gardner expects to add two more food carts, which he’ll position on the park’s northeastern corner, by Sept. 15, when Ankeny Square will have a grand re-opening. Gardner leases Ankeny Square from the city for $1 a year, and he is responsible for paying utilities. The contract with the parks bureau will be renegotiated after two years. He charges the food carts rent for the space, making an income for himself. Gardner is at Ankeny Square every day; he feels a fierce ownership over the space. He looks over at the food carts. During a break between music sets, two men can be heard shouting at each other and walking down the median on Burnside. Gardner follows them, intending to break the argument up, but the men separate before he catches up to them. A couple of hours later, two men get into an argument about a pipe and how much it costs. Gardner defuses the encounter. One of the men offers him a Negra Modelo, and he turns it down. 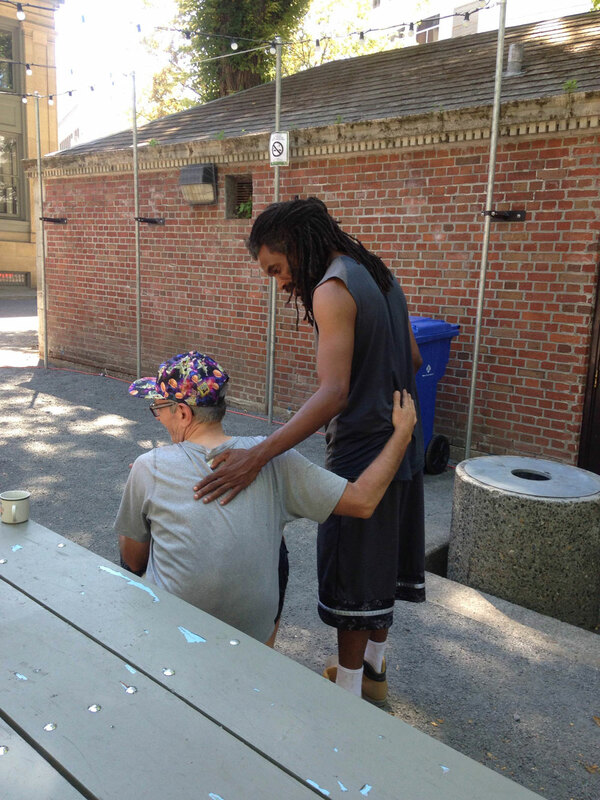 Jamal Gardner, right, checks on a community member at Ankeny Square. Gardner is the owner of Grubbin’, which is bringing performance artists and multicultural food carts to the park. He hopes that in a few years, no one associates Ankeny Square with its seedy past. During the performance, a man with a severely hunched back was balled up on the ground, as if he had fallen over. Gardner walked over to check on him. “Grubbin’ became a feeling,” Gardner said – that feeling a person gets when they’re hanging out with friends or family, enjoying a meal together, connecting, creating a community together. Gardner grew up in Brooklyn, on Ocean Avenue in the Flatbush neighborhood, which was predominantly Jamaican, Puerto Rican and Dominican. He witnessed a murder when he was 9 years old. At that point, he learned he had to be mean. He dealt drugs and moved to Portland in the mid-1990s to be closer to his mother and three siblings. And then, he did go to prison – but it was well after his 18th birthday, for charges related to domestic violence toward his then-fiancée. He served a 10-year sentence at the Columbia River Correctional Institution, a minimal-security prison in Portland. Gardner, a musician who raps and writes rhythm and blues “like it’s going out of style,” became a fervent participant in a group called Arts in Prison. He said it helped him learn how to be vulnerable. He also took business and entrepreneurship classes and began to formulate plans for Grubbin’ before his release Dec. 4, 2015. Gardner cried like he’d won the lottery when the parks bureau told him his proposal had been accepted. He was walking across the Morrison Bridge when he got the call. He was told during an interview with finalists that the bureau would notify him with a decision within two days. But it had been two weeks. He didn’t think he had gotten it. He said the parks employee told him: We wanted to just congratulate you and let you know that you got it. “I just started screaming in the middle of the bridge,” Gardner said. He thinks he cried for nearly half an hour. Johnny Helmka performs bluegrass at Ankeny Square in Portland. After Irving performed, a solo guitarist performed a set of folk rock songs. Then a 20-something young man got on the stage with an acoustic guitar. He was a bluegrass singer, but you wouldn’t guess it by looking at him – he was wearing baggy jean shorts, a large red t-shirt and a blue bandana on his head. He closed his eyes and hollered into the microphone, singing about heartbreak and love. Anyone listening could close their eyes and be in a 1950s-era Texas honky-tonk bar. The next act was a friend of Gardner’s, who DJs ’90s pop and rock power ballads. Michael Jackson. Whitney Houston. People danced as they walked by. A homeless woman in a wheelchair danced in her seat to every song, each musician throughout the afternoon. Gardner walked up to her and introduced himself. Ankeny Square’s new mission is already working. If you’re a performer interested in performing at Ankeny Square, Jamal Gardner can be contacted at grubbinpdx@gmail.com.